Robin Youngs, Edward Fisher,	The Journal of Laryngology & Otology, Volume 127 Issue 7, p 629. E Warner, M Birchall, M W Lowdell,	The Journal of Laryngology & Otology, Volume 127 Issue 7, pp 630-637. C E B Giddings, J Rimmer, N Weir,	The Journal of Laryngology & Otology, Volume 127 Issue 7, pp 638-642. M D Darley, A A Mikulec,	The Journal of Laryngology & Otology, Volume 127 Issue 7, pp 643-649. A M Augustine, L Varghese, R C Michael, R R Albert, A Job,	The Journal of Laryngology & Otology, Volume 127 Issue 7, pp 650-655. U A Kumar, M Jayaram,	The Journal of Laryngology & Otology, Volume 127 Issue 7, pp 656-665. Modified Lothrop procedure in cystic fibrosis patients: does it have a role? M-C Jaberoo, M-A Pulido, H A Saleh,	The Journal of Laryngology & Otology, Volume 127 Issue 7, pp 666-669. F Tanweer, K Mahkamova, P Harkness,	The Journal of Laryngology & Otology, Volume 127 Issue 7, pp 670-675. E Ozer, B Naiboglu, U Karapinar, A Agrawal, H G Ozer, D E Schuller,	The Journal of Laryngology & Otology, Volume 127 Issue 7, pp 676-680. A Prasai, P A Nix, M Aye, S Atkin, R J England,	The Journal of Laryngology & Otology, Volume 127 Issue 7, pp 681-684. A J Battoo, Z A Sheikh, K Thankappan, W Hicks, S Iyer, M A Kuriakose,	The Journal of Laryngology & Otology, Volume 127 Issue 7, pp 685-690. 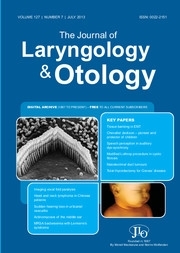 B Sobrino-Guijarro, J S Virk, A Singh, R K Lingam,	The Journal of Laryngology & Otology, Volume 127 Issue 7, pp 691-698. J Wang, C-P Cai, S-F He, S-L Wang,	The Journal of Laryngology & Otology, Volume 127 Issue 7, pp 699-704. A Nikkar-Esfahani, D Whelan, A Banerjee,	The Journal of Laryngology & Otology, Volume 127 Issue 7, pp 705-707. A C Hall, A C Leong, D Jiang, A Fitzgerald-O'Connor,	The Journal of Laryngology & Otology, Volume 127 Issue 7, pp 708-711. PJ Kullar, P Yates,	The Journal of Laryngology & Otology, Volume 127 Issue 7, pp 712-715. Y Takata, H Hidaka, K Ishida, T Kobayashi,	The Journal of Laryngology & Otology, Volume 127 Issue 7, pp 716-720. V Kizhner, G Samara, R Panesar, Y P Krespi,	The Journal of Laryngology & Otology, Volume 127 Issue 7, pp 721-723. J J Xu, K Kwan, K Fung,	The Journal of Laryngology & Otology, Volume 127 Issue 7, pp 724-727. H Al-Reefy, C Hopkins,	The Journal of Laryngology & Otology, Volume 127 Issue 7, p 728.